Therapeutic Products from Evolv Health & Wellbeing Store can make a thoughtful and beneficial gift for another, as well as delivering benefits to yourself. At Evolv Health & Wellbeing Store, our most popular therapeutic products include magnetic bracelets and amber jewellery, both long renowned for bringing relief from many ailments and conditions. Magnetic bracelets have been worn for thousands of years as a means of relieving the pain and discomfort of rheumatism, arthritis, and other conditions. 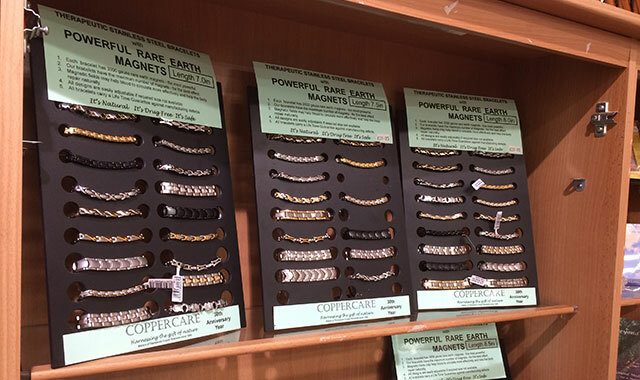 We stock magnetic bracelets from the Coppercare range, which also have powerful Rare Earth magnets embedded on the inside, which many people believe provide additional benefits. Our Amber Jewellery range is manufactured and supplied by Amber SOS, an Irish company based in Co. Mayo. Amber gems not only look good, but are also long renowned as a natural aid for better health. Amber can ease the discomfort of chronic pain conditions and injury, can aid restful sleep, and can help resolve skin conditions. It can stimulate the body to heal itself. Our range includes necklaces and bracelets for ladies and gents; cotton-threaded necklaces, bracelets, and anklets for children; pendants, rings, and bangles; and even amber collars for pets. To see these and our other therapeutic products, just call to Evolv Health & Wellbeing Store at 2 Castle Hill, Enniscorthy, Co. Wexford. We’re open 9.30 a.m. to 6 p.m., Monday to Friday.